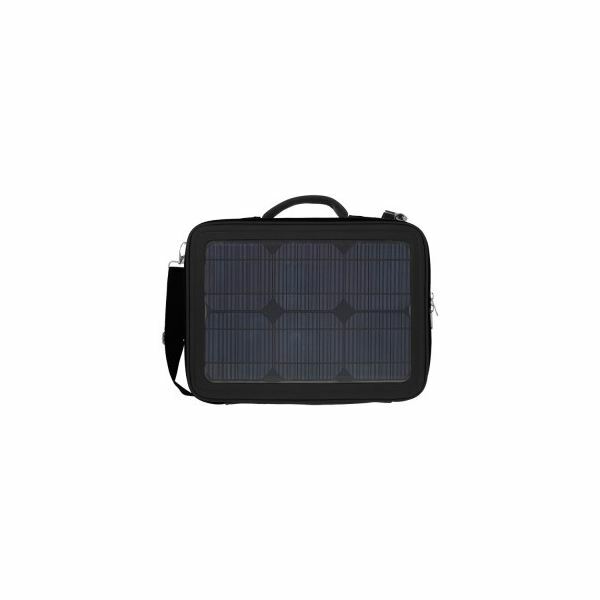 If you are looking to power your office on the go, one of the most functional options is a solar charging laptop bag. The best solar laptop bags are outfitted with 15 watt panels where the ones to avoid have 4-watt panels. The 4-watt versions are good for charging cell phones, PDAs and other handheld devices, but only the 15-watt varieties can handle the charging needs of an office quality laptop. This is the top of the line laptop charger bag on the market today. 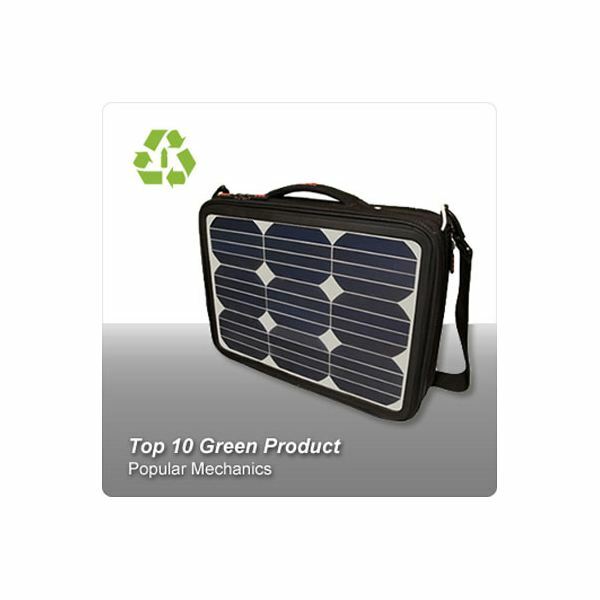 The professional looking, briefcase like, Voltaic Generator is made of recycled materials incorporated with a 14.7 watt solar charging panel that easily powers a mobile office. One hour of exposure to full sun can charge a laptop for up to 45 minutes of use (in the eco-mode). The great thing about this charger is that it can output at 19V, 16V, 12V and 5V so any of your electronic devices can be charged. Your entire office can be ready to go on about 8 hours of direct sun (the laptop taking the longest – 5 hours). 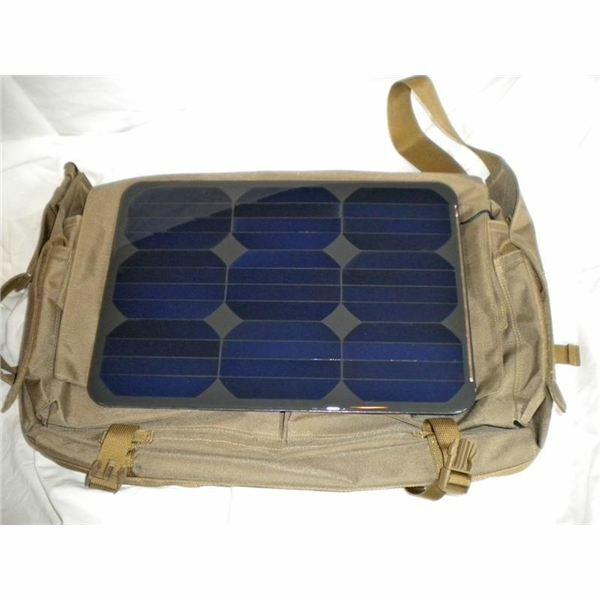 The bag can handle a 17” laptop easily and weighs in at 4 ½ lbs including the battery which can be charged when the laptop isn’t connected and then used as a secondary power source when working off grid. The bag also comes with a 2-year warranty on the panels and 1-year comprehensive warranty on the battery, so you can buy it with confidence. When ordering, you need to specify the battery type, HyperMac (for Apple products) or Tekkeon for all others. This presents the only drawback for the bag – it isn’t compatible with both Apple and Non-Apple systems at the same time so if you own an iPhone and an Alienware Laptop one of them isn’t getting charged without a special adapter. In addition, the price point is currently $499.00, which limits its value to use rating, is it worth $500 to charge you laptop while on the go? At $573.75, this bag is even more expensive than the Voltaic Generator, but is designed more for the outdoorsman. This is evident from the khaki material look and the backpack format. The bag can handle a 17-inch laptop and charges as well as the Voltaic (a full laptop charge in about 5 hours of direct sunlight). This bag was originally designed for combat troops to use in desert environments. This bag also includes the myPower ALL Plus MP3750 Rechargeable Battery from Tekkeon that delivers up to a 19V power supply. The 7 ½-hour backup battery life allows almost any electronic device to be charged from a cell phone or PDA to portable CD players. The advantage that this model has over the Voltaic is the included USB access port that can be used to directly power devices in on the go. The bag itself, is constructed of a high tensile nylon fabric and the solar panels can be cleaned by wiping them down with a damp cloth. This is an ultra portable and very sturdy bag. It is triple polyurethane coated for water resistance and all of the pieces are double stitched to prevent ripping or fraying. If you are an avid outdoorsman with a penchant for the high tech, this is the bag for you. 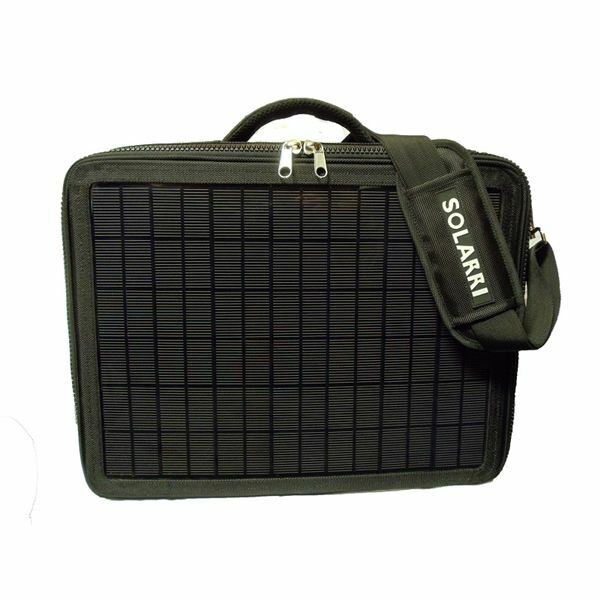 The Solarri solar bag gives high-end performance at a very competitive price. The $399.99 bag offers several of the functions of the previous two competitors and has an extended output range that includes 3V, 5V, 6V, 9V, 12V, 16V, 19, 22 V, or 24V as well as a complimentary set of universal adapters so it is a complete system without the need to purchase peripherals. So why isn’t this the top rated case in the category? The battery is huge. It is a large rectangular, flat piece of hardware. It is hard to connect to the laptop while it is in the bag and changing connections requires access to the front panel, which isn’t easy while in the bag. The battery has to be charged to a 25% capacity before it will begin to charge a laptop (other devices can be charged immediately), but the charge rate is faster than the sunlight to energy conversion rate so a laptop will suffer intermittent power reduction even in direct sunlight. This means a laptop cannot be run directly from the solar power generated by the bag unless the battery is partially charged. On the up side, a netbook can run for up to nine hours on a fully charged battery and a full sized (17-inch) laptop can go for up to three. This is a nice, stylish bag, for the upscale executive who likes to work in the park on lunch hours. Like the other cases on this list, the Road Warrior Laptop Case has 15 watts of solar charging power. The $369.00 price is in line with the others as is the five-hour laptop charging time. It comes with adaptors for most major laptop brands but if you own a Mac you’ll need to purchase an adapter at an additional cost. The bag is not as sturdy as some of the others nor does it have the stylish lines of the Solarri but it is functionally the same. It comes with a battery so solar energy can be saved and used when needed (like the others). The USB output works at a 16-volt to 19-volt range. It’s a good case for the price and will suit the needs of anyone who owns a non-Apple laptop. iPad users may be feeling left out as they read this list but here is the laptop bag for you. The Element5 Mini L is designed specifically for the needs of the on-the-go iPad user. The e5 Mini L will provide up to five hours of battery life to an iPad or significantly more to Apple devices like the iPod and iPhone. This Swiss made gem has clean lines and a contemporary look. 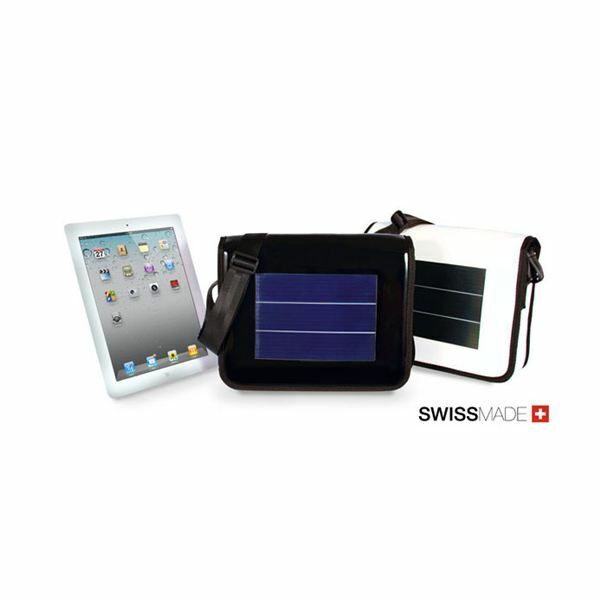 It comes in both black and white varieties and works not only with iPads but also with any USB chargeable device. With the current exchange rate the 349 Swiss Franc price is approximately $433 American. One look at this extremely classy solar bag may have you sold. All images from the above websites under the auspice of fair use.